The video rental pet shop. The bell rings as you walk in. It’s the smell that hits you first; the musty, slightly acrid aroma of pet food, treats and bedding mingled with an overpowering air freshener used to mask the first smell. It sticks to the back of your throat. “Yes thanks, we’re going to ask for it for Christmas I think.” I say passing Sonia the N64 game I’d rented for the last two days. Sonia is an exotic looking lady with black curly hair piled high on her head and a generous helping of makeup. Her husband Barry is less noticeable and chatty so he sticks to dealing with things ‘out back’. “Some bedding for my hamster Joey please.” I secretly wish I could get the pink hamster ball I spotted out of the corner of my eye earlier on. Maybe next week. I was thinking about the project when a memory popped into my head. I grabbed my phone and jotted down my thoughts. 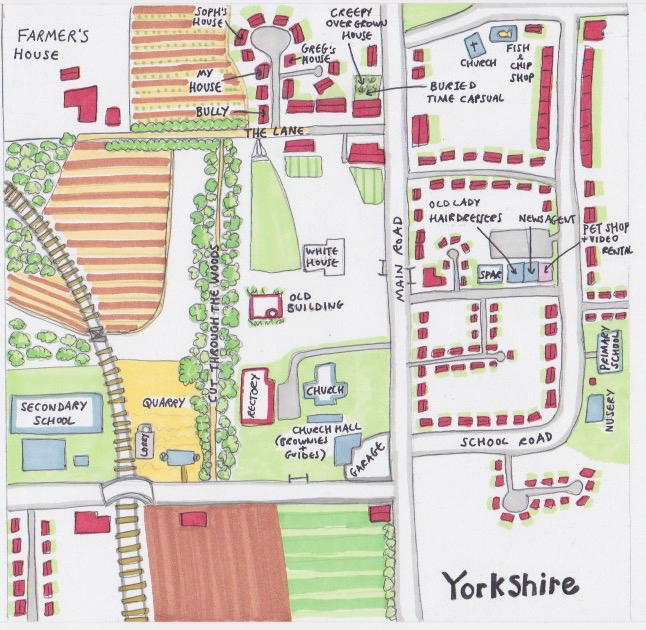 I didn’t revisit it for another few weeks; then I did it the ‘proper’ way – I drew my map and noted my memories. Doing the map helped a lot, it brought back little details of the pet shop that I didn’t initially think about. After I’d written my memory, I wondered what had happened to Sonia and Barry. The pet / video shop closed a long time ago and they left along with it. Now it’s a Chinese takeaway.